In trying to write a religious autobiography, I first had to answer the question of “Who am I?” The simple answer is white, female, Christian. But where is the fun in that? The more complex answer begins with a single word: rebel. On my mother’s side of the family, we are all Irish, and I do mean all. My grandparents were 13th cousins who met at a family reunion. This vast and sundry assortment of Simpsons have all been, for the most part, Protestant, going all the way back to County Tyrone in the 1700’s. There was, of course, one cousin, Peter Gallagher, who broke his mother’s heart when he married a Catholic girl and converted, raising the children as Catholic, but we don’t talk much about him. When our Simpson ancestors emigrated to the (brand) New Country in 1793, they joined or helped form Presbyterian churches in the communities they chose as their homes. My mother’s family came to the United States by way of Pennsylvania, settling mostly in Ohio, Indiana, and Illinois. My maternal grandmother lived her entire life in Peoria, IL. My grandfather was born in Minneapolis, MN, but moved to Peoria when he was less than a year old. Even though they were both raised in Peoria, they attended different churches. My grandfather was raised in First Congregational Church, while my grandmother and her family all attended Arcadia Avenue Presbyterian Church. On the other side of the aisle, as it were, are my father’s family – the original rebels, the Germans. Both of my paternal grandparents came from good German stock, who brought their German Protestant traditions with them when they emigrated. Following the German Reformed Protestant tradition, my grandparents became part of the United Church of Christ. While my mother’s family came to this country when it was just starting out, both of my grandparents on my father’s side were first-generation Americans. Their parents were born in Germany, but chose to come here in the late 1800’s to make better lives for themselves. These two family groups – my mother’s family and my father’s family – were from communities a little over 100 miles apart. They only met because my father chose to attend university in the town where my mother grew up. If it had not been for that one choice, I may not have been here. My father’s family settled in northern Illinois, in a small town about 30 miles west of Rockford, IL, called Freeport. While my father was one of only two children, his father was one of nine children and his mother was one of seven. All of these aunts and uncles lived in and around Freeport, so there were always plenty of German Protestants around. 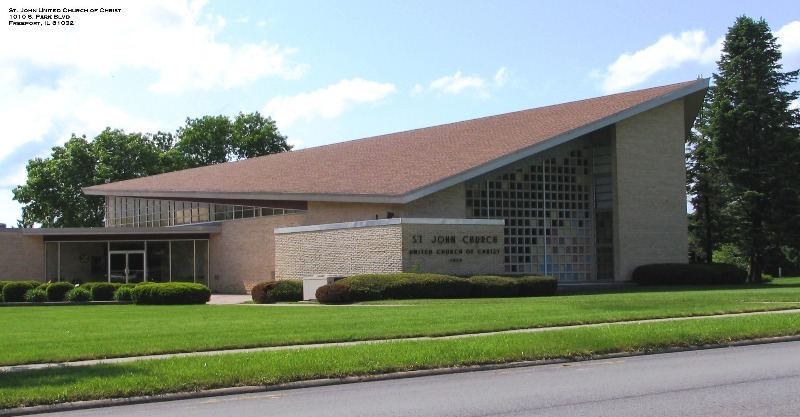 My grandfather helped establish St. John’s United Church of Christ in Freeport, IL and was one of their founding members. There are still people at that church who fondly remember my grandparents and tell wonderful stories about their contributions to the church. But now I would like to digress, and tell another story. The reason for this will become clear shortly. In 1800’s, Peoria, IL was a booming little metropolis, filled with churches of all denominations. This story focuses on two in particular – First Congregational Church and Second Presbyterian Church. 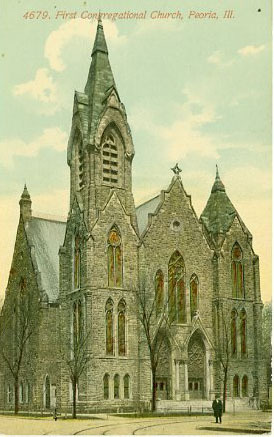 First Congregational had built one of the physically largest churches in the city. It was an imposing structure filled with intricately carved black walnut décor, and it was referred to as the “Protestant Cathedral”. Second Presbyterian was also a gorgeous church, built entirely of hewn stone, designed by the same architect who built the famous Water Tower in Chicago and the infamous prison in Joliet. In March, 1936, an overnight fire destroyed First Congregational, burning it to the ground. The parishioners were left without a church home. The economic devastation of the Great Depression had taken its toll on all the churches in central Illinois. Rumors of possible war in Europe were also having a negative effect, and the churches were struggling. Even before the fire, both First Congregational and Second Presbyterian had been in various informal talks with other neighboring churches about consolidation or merger, due to financial constraints and low attendance. 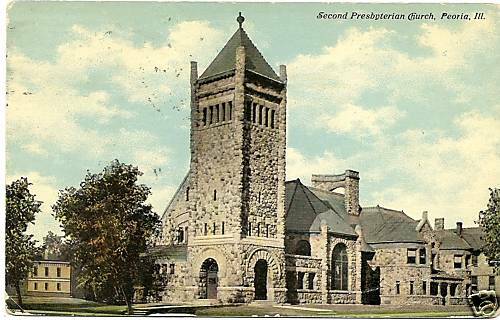 When First Congregational burned, Second Presbyterian graciously offered to share its building – both denominations would worship there, albeit in separate services at different times. Soon, members of both congregations began to notice some “cross-over” – members of the “other” church coming to their worship service. Informal, and later, formal talks about the two denominations merging began. There was a lot of disagreement, but it was not until the influential ladies of the churches got together that things were finally ironed out. An agreement was struck that the two churches would enter into a formal Federation – an agreement to worship together while still maintaining their denominational independence and connection to their larger, national denominations. Thus, First Federated Church of Peoria was born in 1937. This church is half United Church of Christ, half Presbyterian. It was this church that my maternal grandparents started attending shortly after they got married, as it was the closest Presbyterian church to their new home. This is the church my mother and uncle were raised in. It was this church that my mother was attending when she met my father, who had come to worship there because it was one of the only UCC churches in Peoria. So, now you know where I come from. I was raised in this weird casserole church (where they serve casseroles at potlucks) where nobody really knows what you are (Presbyterian or UCC) unless you get voted into a position on a board for something because all the boards are still split up 50/50. But that is only part of the story. At the beginning, I included the word “rebel”. Yes, I have the genetic Irish rebel DNA (we who will rebel against just about anything just for the sake of rebellion, at times) and the German rebel DNA (God Bless Martin Luther, the original rebel), but I also have my own, personal rebellious streak. I was raised a child of the 1960’s and 1970’s, when if you didn’t at least question authority, there was something wrong. I was also raised with a love of drama and high theater. And, in my late teens, went through one of those phases (as teen girls are often wont to do) where they are searching for meaning and depth and insight. So, after attending a spiritual self-awareness weekend sponsored by the Catholic Church, of course I began the process of conversion. Prior to this, I had attended Sunday School, Vacation Bible School (both as a camper and a counselor), participated in Junior High Youth Groups and High School Youth Groups, and even gone on Mission Trips with my peers at First Federated. The only problem was, when I graduated high school at 17, there was nothing there for me. I was expected to show up at church and just sit there and listen for an hour and soak it all in. I had spent years going to church and being active in church, whether it was playing parable games in Sunday school or doing team-building exercises during Youth Groups. As young people in the church, we had been learning to live our beliefs, not listen to lectures on them. I was bored out of my skull. Attending Mass is Catholic Calisthenics. You kneel. You sit. You stand. You sit. You kneel again. You get up and walk around. You kneel some more. You sit. You stand. You go home. It is active. And it is interactive. They talk, they you talk. There is a back and forth. I could go to Mass and feel like I was a part of something. And it wasn’t just the superficial things like that. I will never forget sitting in a darkened stone church in Chapel Hill, NC at 3:00 p.m. on Good Friday, waiting for the Mass to start, wondering what was taking so long. Why were they running late? It was so quiet. And then, from the back of the church, hearing the devastating sound of a 16p nail being driven into a 6”x6” piece of wood. The echo of the hammer ringing off the nail and the horrible squeak as the nail split into the wood again and again. To this day, I get chills down my spine and tears in my eyes. I continued to attend the Catholic Church as long as I lived in North Carolina. When I moved back to the Peoria area, I found the Bishop here was a lot more conservative than the one I had been under in NC and I found the messages I was hearing did not seem to be as warm and as embracing here as they had been there. Not finding a parish that made me happy, I came “home” to my Presbyterian/UCC roots. I have been back at First Federated for almost 20 years. My husband and I were married there, his two children from his first marriage were confirmed there, and our son attends Sunday school, Vacation Bible School, and our church’s LOGOS program. I have taught Sunday school for the past several years and have been a VBS volunteer for the past six years. I have served on our Board of Deacons, visiting the ill or shut-in, and have worked with our Missions committee on various fundraisers for community outreach programs. Along the way, I have tried to be a student of the world of religion. I have attended Rosh Hashanah services with friends several times, as well as Yom Ha Shoah services (including serving as a name reader) several times. The Islamic Center recently held an Open House and Peace Rally at the Mosque, where they welcomed anyone who was interested to come in, learn about their culture, take a copy of the Quran, and meet members of their community and ask questions. I took my son. I explained to him why he had to sit in one part of the room and I had to sit in another. I explained why we had to take our shoes off. I have several friends who are Witnesses and talk “Bible” with them on a regular basis. In my journey through this life, I have come to understand that “God” is known by many names. He may be God or Jesus or Yahweh or Jehovah. He could be Allah or Buddha or Mohammed. He could be the Rainbow Serpent or the Great Manitou or the Tao or the Kami or any of the Hindu gods. It is not for us to decide or judge what is right or what is true. What works for one person works for them because it works for them. That doesn’t mean it will work for anyone else in the same way. Spiritual journeys are, by definition, personal. You have to go them alone. You may walk and talk with others along the way, but it is what is in your own heart and mind that you must settle down with at the end of the day. Posted by admin on January 13, 2017 at 8:47 pm under Blogs.